This route to the summit of South Fortuna Mountain leaves from the San Diego River Crossing Trailhead. Directions: Like all of the mountains in the park, there are numerous ways to summit South Fortuna as many of the park’s trails intersect. The route I am about to describe leaves from the San Diego River Crossing Trailhead at the corner of Jackson Drive or Mission Gorge Road, where there is a parking area that is open from 8:00 a.m. through sunset. Hikers should be aware that at sunset, the park rangers do lock this gate, so there is a real possibility that one’s vehicle can be locked in the park overnight. Alternative routes to South Fortuna’s summit are from the Oak Canyon region, and also from the West Fortuna staging area. After heading up for a short distance, the route descends into Suycott Valley, and Suycott Wash, which is a peaceful, green area of the park. From the parking lot, the trail descends along a fire access road to the San Diego River crossing. Depending on the year, and the season, the river will either be a slow trickle, or a raging torrent. At times when the flow is high, hikers should judge the conditions accordingly, and not attempt to cross. Having said this, as this hike is in San Diego, for most of the time, and most years, hikers will have the ability to either cross the main river section, or along a permanent concrete break. From the western side of the river, the route ascends steeply up another fire access road, before leveling out above Suycott Valley. At this juncture, the route intersects with trails from the West Fortuna staging area above, and trails from Suycott Valley below. The route hikers will want to follow from this point is downhill into Suycott Valley, past the Suycott Valley picnic area and down into Suycott Wash to the south. As a general rule, Mission Trails does an excellent job of signing all of its trails at the junctions, so there is a very low chance of becoming lost. Once out of Suycott Wash, however, the trail ascends, before reaching a very steep section with wooden "steps". Once in the Suycott Wash, the trail winds under some oaks and over a bridge before ascending up toward the summit. At this point, the south-west face of the mountain is fully visible, and from this vantage point, it appears much higher than a thousand feet. After a short uphill section, the mountain not only looks higher, but feels like it is higher as the trail ascends steeply up a series of wooden “steps” for a half mile. During this section, the trail ascends 560 feet in about a half mile. On the plus side, this is a great workout and challenge; on the down side, this portion of the route feels like a grind, especially when one considers the elevation gained - and then lost by climbing up and then down into Suycott Valley. From the summit, hikers have great views of Pyles Peak and Cowles Mountain, among other areas in the county. At the end of the steps, the trail levels out and gradually ascents to the summit of South Fortuna over a short distance (.3 miles). From this point, hikers will have views of Suycott Valley below, Cowles Mountain and Pyles Peak to the south, and on a clear day, the city of San Diego, and the Pacific Ocean. 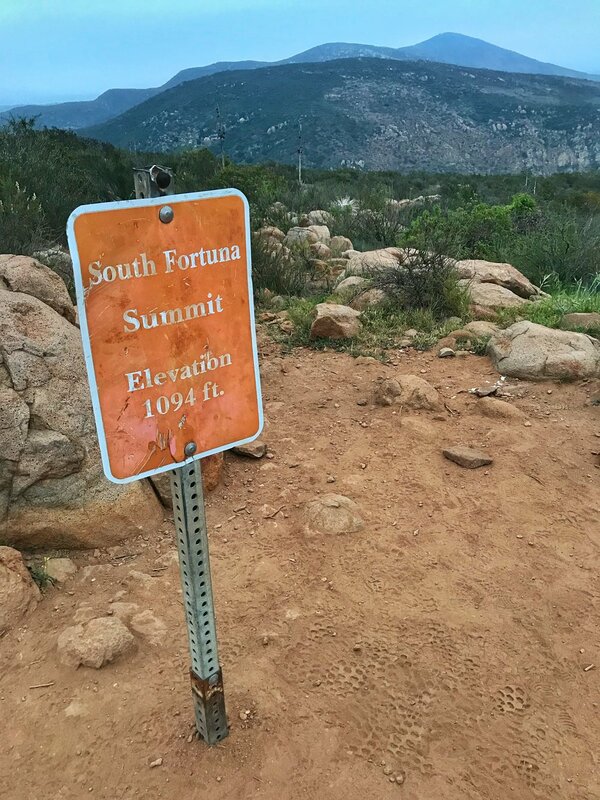 Once at the summit, the view does not change dramatically; but does have the added aspect of a view of the Fortuna Saddle, and North Fortuna and North San Diego county. Once done, hikers can either return the way they came for a challenging but manageable five mile roundtrip hike with 1,245 feet of elevation gain; or continue along the saddle to North Fortuna, or back down to the staging areas via Oak Canyon. Assuming one wants to return back to the original trailhead, the route also descends the steps. Hikers can also cross the Fortuna Summit to climb North Fortuna peak as well, for an additional challenge, and additional distance. Tips: Although there is some shade through Suycott Valley and the Suycott Wash, the majority of the hike is exposed to direct sun. Hikers should therefore judge the heat - and conditions accordingly when attempting this route.